In the 1950s we lived in Belton Road, in the Roundhill Area. There were two regular visitors to the house; the dustman and the coalman. Belton road was made up of small, terraced houses. There was no access to the gardens, behind and the pavement, in front, was fairly narrow, so access was difficult. Both the dustman and the coalman would knock on the door and then walk through the house, to the garden. The dustman would pick up the large bin, hoist it on to this shoulder and carry it, back, through the house, to his lorry. The coalman did the same, but in reverse. He would load himself up with a sack of coal and then make several trips, through the house, to the coal bunker – something my father had built. Today it seems odd to think of these men walking through the house but, clearly, it was common practice then. Some householders also had ‘pig bins’, small, metal bins with a ‘locking’ cover that kept birds and small animals from getting in. The pig bin was for leftover vegetable matter. Why some houses had them and not others, I do not know. The final visitor, to the road and not to the house, was the rag and bone man, who drove around the streets with his cry of ‘any old rags, any old lumber?’ As a child, I used to wonder what ‘lumber’ was. I am not sure I know what it is, today. 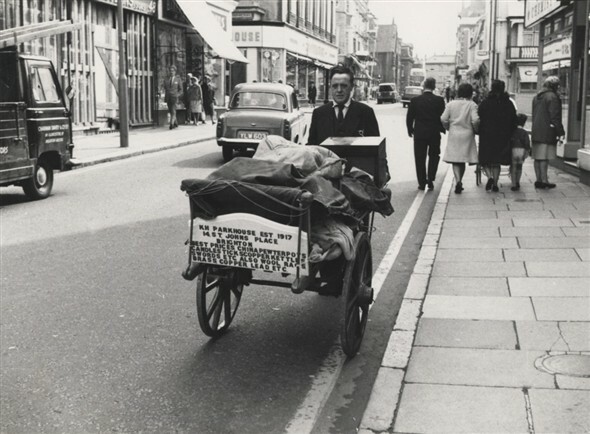 The other distinguishing feature of the rag and bone man was that he rode around on a horse and cart. He must have been one of the last tradesman to do this. When the horse and cart finally went, so did the rag and bone man. We were lucky; the coalmen used to tip their bag’s content down the coalhole at the front of the house into a basement storage area. It was a bit noisy, though! I can’t recall the activities of the dustcarts in those days, except that the lorries had sliding doors on top of the trailers at the back, but the rag-and-bone men were everywhere. The other tradesmen I remember were the men who came with blocks of ice for the fish shops. In our case it was Macfisheries. They wore hoods of some hessian-like material that also ran down their backs This protected them a bit from the ice, but it must have been a rough old job, and not for the frail in body, given the weights involved! I can remember the ice blocks, Stefan, but not the men who delivered it. I have a dim memory of someone dragging the ice along the pavement with a hook. I recall being intrigued about whether or not the ice (on the pavement side) got eaten. 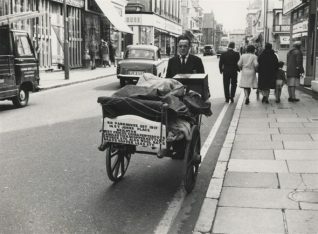 Another local trader was the milkman who, for a while, pulled along an electric cart, which the milkman walked in front of, using a long, handle that stuck out of the cart. In fact, the cart pushed along the milkman. It seemed to me, as a child, an unfair situation as the milkman clearly had to move at the speed of the cart (quite fast it seemed to me). Looking back, I suppose it had some sort of three speed mechanism. Otherwise it was ‘push down’ to go forward and ‘pull up’ to stop. The very skillful operators found ways of sitting on the front of the cart and somehow manipulating the handle affair at the front. I was always impressed by this. Especially when they went up hill in this format. Milkmen in those days also delivered small bottles of orange squash. I am not sure why. This was not the thick, government approved, variety but the sort that you might have diluted with water in your kitchen. Later on they branched out into all sorts of grocery items. Tesco on a cart. I have some vague memory of some road sweepers also using a hand operated electric propelled cart, similar to those used by milkmen, but with curved sliding lids covering the rubbish compartments. Or am I imagining it? There were several rag and bone men or “Totters” in Brighton, I remember quite a few of them and they were all characters in their own right. The most prominent in my youth was Joe Mitchell who had a horse and cart and was easily identifiable by his trademark black Homburg hat and his brown overall coat. I used to take my daughters to see his horse on Sunday mornings at his stable at the back of Jersey Street. Another stand out man who was known as the Gentleman Totter who was always immaculate in a pin stripe suit and trilby hat and pushed a hand cart, great memories. You are right, Alan, the road sweepers did use them and they did have curved sliding lids. An update on the pull-along, electric cart. I just saw one being used in Cardiff. So much for thinking that they were a star of the 1950s!